I got the March Saveur recently and it's theme is butter. 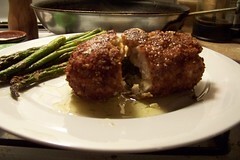 They had a recipe for chicken Kiev that looked stunning. This is how I made it. I baked it after quickly frying it because I was afraid the butter would ooze out after 25 minutes of frying, and also because gf breadcrumbs brown much faster than regular ones and I didn't want burned-crust Kiev. 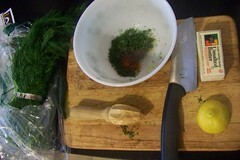 Step 1: Make lemon-dill butter. Mash up a stick of good butter (room temperature) with the juice of 1/2 lemon (or less), a good handful of dill, finely chopped, salt and pepper and a big pinch of cayenne. 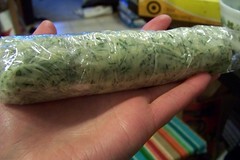 Step 2: Form the butter into a log shape, and wrap in plastic wrap. Step 3: Refrigerate the butter log for 2 hours, or stick in the freezer for about 1/2 an hour. 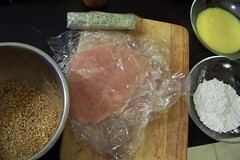 Step 4: While the butter is chilling, pound flat your chicken breasts between 2 pieces of plastic wrap. 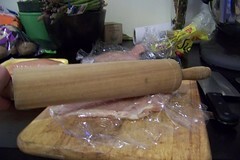 Use a mallet if you have it, or a rolling pin of heavy pan. Step 5: Assemble your ingredients. Cut the butter into 4 equal sized pieces, put 1 c rice flour into a bowl, beat 2 eggs in a seperate bowl, and mix salt and pepper and some dried thyme in a bowl with about 2 c breadcrumbs (I toast then process in the food processor gf bread from the grocery store, since I don't like eating it). Have ready a large plate to put your finished chicken onto. Step 6: Roll the chicken securely around the butter logs. You can flatten or reshape them as necessary. 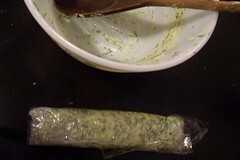 Fold the ends over, then roll, making sure it will securely hold the butter. Step 7: Dredge the rolled pieces carefully in the flour, then the egg, then the crumbs. 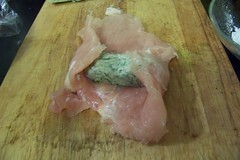 Press the crumbs into the chicken and then gently shake off excess. Place on empty plate, then repeat. Step 8: Chill for 2 hours. 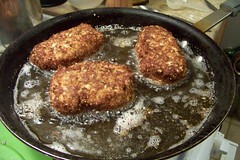 Step 9: Fry chicken, carefully sliding into the oil, sealed side down. Preheat the oven to 350. 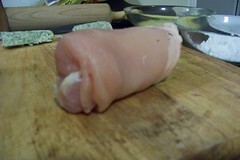 Turn chicken when well browned, carefully, so you don't squeeze out the butter. Transfer to a pan, and bake for about 20 minutes. Serve immediately. Wow looks really buttery! Did it really to say to fry in oil for 25 minutes? I could imagine the a burnt buttery mess that would make! I like using herbed butter,but never thought of stuffing chicken (or anything else) with it. I love butter!! Yes, it really said fry for 25 minutes, I thought it didn't sound right either. You should try it! The butter keeps the chicken super tender! Sounds delicious...this is going in the recipe file for when we need something new to try!